WOLRD CHAMPION COWBOYS RIDE FOR TEAM DUKE! Sixgun and rifle packin’ cowboys and cowgirls from the Cowboy Mounted Shooting Association gallop at top speeds to win World Championship Titles, while representing the Duke! During the patriotic Grand Entry of the CMSA’s Starline Friday Night Showcase, where the public watched as the top ten cowboys and cowgirls in various competitions, shot and rode for trophies, cash and honors, the Team Duke banner was proudly galloped around the arena by youngster Kayla Lewallen, of Trinity, North Carolina to the rousing cheers and applause from the excited audience. Racing through a course on Snippy, an AQHA registered quarter horse, Chad Little, of Saint Michael, Minnesota wins the coveted 2010 Overall Cowboy Title in this CMSA World Championship match! The CMSA is proud to ride for Team Duke since this sport was in part inspired by John Wayne, in his action-packed Western movies. 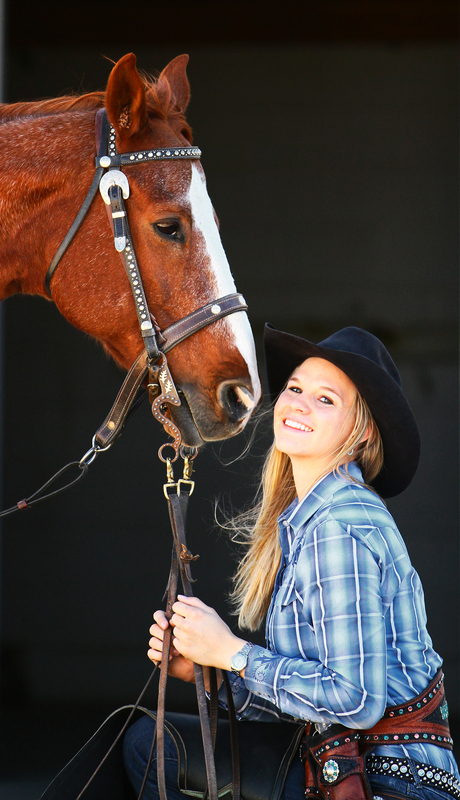 Taking her second Overall Cowgirl Title in the CMSA’S 2010 World Championships, Scottsdale, Arizona’s 16-year-old Melissa Dragoo takes a moment to reflect on her victory and thank her AQHA registered quarter horse team mate, Broadway. Inset shows Melissa and Broadway in action as she blasts a balloon target in this lightning-fast Western competition. Team Duke's banners are always hung proudly and prominently at every major CMSA event around the country. 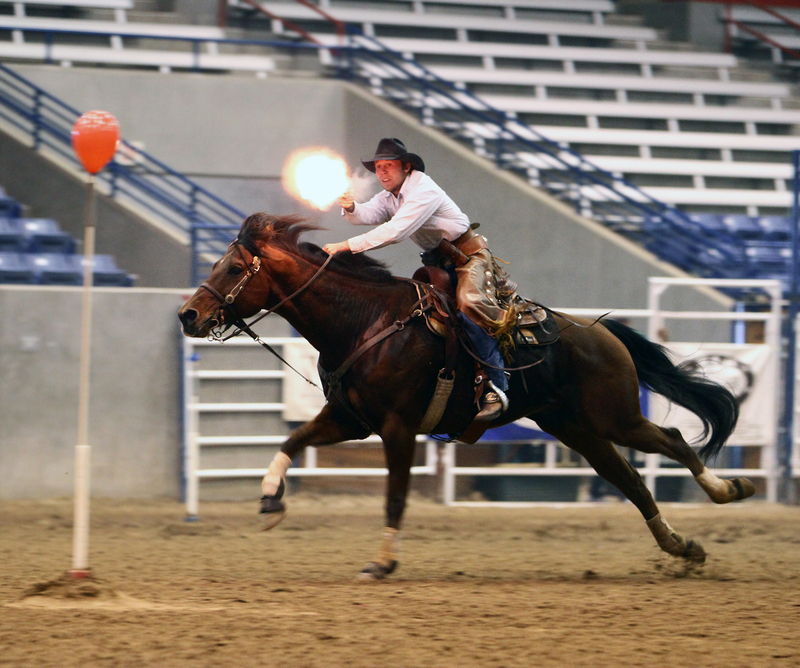 Here, a competitor gallops through a shooting course, during the 2010 CMSA World Championship, held in Amarillo, Texas this past October 20-23. 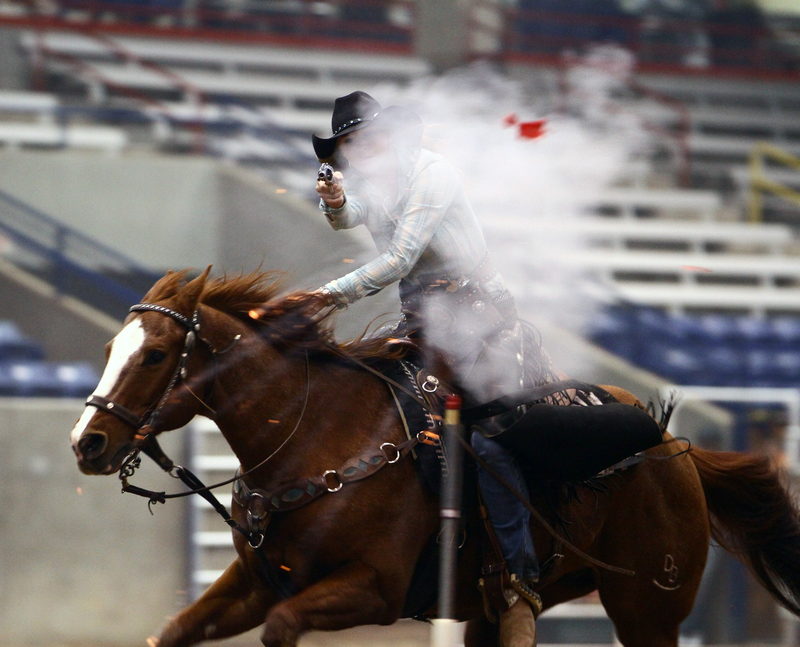 Over 300 of America’s most athletic horses and straight shooting cowboys and cowgirls gathered to compete at the Cowboy Mounted Shooting Association’s (CMSA) 2010 World Championships October 20-24, at the Amarillo National Center, in Amarillo, Texas. As the culmination of a year’s competitions that include the CMSA’s Big Four events (National, Western, Eastern and World Championships), this championship match pitted the best of the best cowboy mounted shooters in the world. 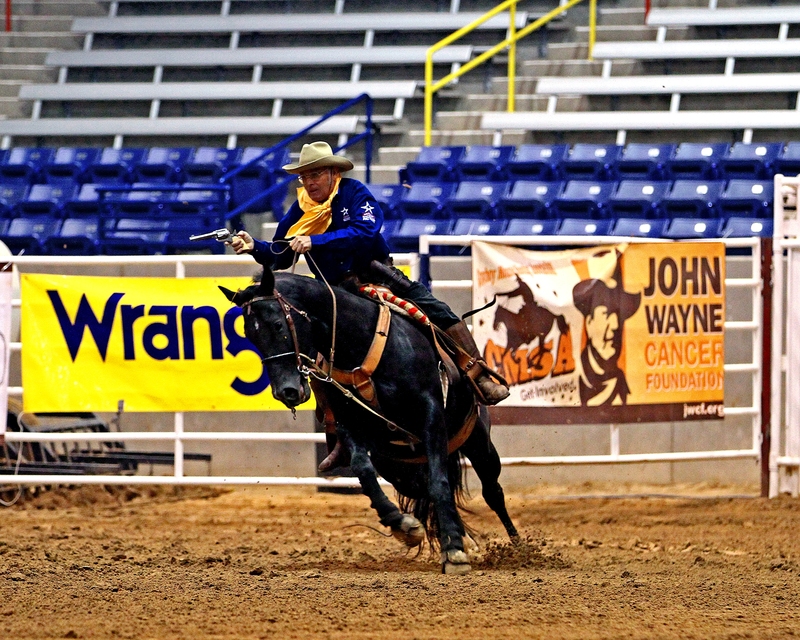 Throughout the year, the CMSA rides as Team Duke, on behalf of the John Wayne Cancer Foundation (JWCF). The CMSA, the governing body of the sport of Cowboy Mounted Shooting, has been riding for the JWCF for the past several years at their major events, and a number of their affiliated clubs have put on events to benefit the JWCF. Through riding as Team Duke, the CMSA and its members are able to promote awareness of the research being done, and care provided by, the John Wayne Cancer Foundation all around the United States, along with having the pride of riding in the memory of America’s greatest cowboy—the Duke. At the CMSA Hart Trailers 2010 World Championship over 300 mounted competitors from all over the U.S., as well as contenders from Brazil, Sweden, Germany and Canada were in attendance. Horseback challengers shot it out–in a friendly competitive fashion of course, where two 1873-style single-action revolvers, firing arena-safe blank cartridges are used to break 10 balloons in a series of stages set up in various patterns—to see which cowboy and cowgirl would ride the fastest, with the most hits in the least amount of time, to win the coveted CMSA’s World Championship honors. Besides the main match to decide the top cowboy and cowgirl, there were other ancillary competitions that were also decided at this, the largest CMSA event of the year. For example, during the CMSA’s World, the year-long, nationwide Wrangler Patriot Points Challenge for a beautiful, brand new $30,000 Hart four-horse trailer was decided by a drawing between the eight top cowboy and cowgirl contenders from each of the CMSA’s competitive divisions (skill levels). There were also competitions in the Rifle Class, the colorful Cavalry Class and the American Quarter Horse Association (AQHA) to determine the three top quarter horses of 2010 in this CMSA/AQHA match. One of the highlights for the JWCF was during the Starline Friday Night Showcase, where the best of the best from the Top Ten cowboys and cowgirls in the Rifle Class, Cavalry Class, AQHA competition and the Colt Eliminator (sponsored by Colt’s Manufacturing Co.) are decided in a fast-paced, action-packed series of competitions. 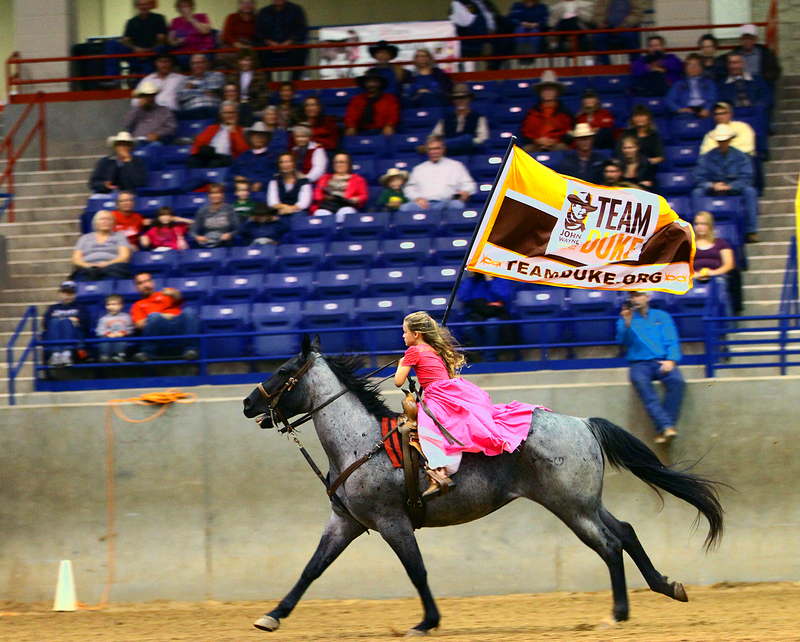 During the patriotic and colorful Grand Entry of this spectacle, the Team Duke banner was proudly galloped around the arena by youngster Kayla Lewallen, of Trinity, North Carolina to the rousing cheers and applause from the audience, and Team Duke banners were prominently displayed around the arena during the entire four-day championship. A special congratulation goes out to the 2010 World Champion Cowboy and Cowgirl Title winners, 23-year-old Chad Little of Saint, Michaels, Minnesota, who had previously won every title in the CMSA except for the World, and Melissa Dragoo, a 16-year old who hails from Scottsdale, Arizona. Melissa is the youngest to ever win a World Title (Overall Women’s World in 2007), winning her second buckle at the 2010 CMSA World! For more information on the Cowboy Mounted shooting Association and Team Duke, go to www.cowboymountedshooting.com and www.jwcf.org.